Rhode Island workers' compensation is a no-fault insurance plan provided by Rhode Island employers which provides medical expenses and lost wage compensation to Rhode Island workers who are injured on the job performing their job duties. Under Rhode Island work comp laws, Rhode Island employees are required to carry workers' comp insurance to cover work injuries. Rhode Island work injury compensation is monitored by the Rhode Island Division of Workers' Compensation. This agency ensures work compensation documents are filed to protect injured workers and employers, work comp claims are paid, and employers have the proper insurance coverage. The Rhode Island Division of Workers' Compensation also monitors and investigates fraud and provides educational services. Other agencies provide additional support services including the Medical Advisory Board which provides information and guidance for medical treatments, the Workers' Compensation Court which manages legal disputes and the Department of Business Regulations which regulates the workers' compensation insurance process. Injured workers who have suffered minor work injuries or who have received just compensation for their work injury may not need legal help, but if a worker suffers a severe or permanent injury or if their employer has refused to provide workers' comp benefits, a Rhode Island workers' compensation lawyer can help. Work compensation laws in Rhode Island can be complicated and vary from other state's laws. Do not allow an employer to dismiss your case or withhold the Rhode Island work comp benefits you are due. Talk to a Rhode Island employment lawyer to get the work comp benefits you deserve. Need legal help getting benefits for your Rhode Island workers compensation case? Simply complete our free form below to get started today! Most Rhode Island workplace injuries which occur while a worker is performing their normal job duties will be covered by workman's compensation. Common work injuries can include the following: Work injuries caused by specific falling or lifting, Work injuries caused by repetitive stress of the job, Pre-existing work injuries which are aggravated by the job, Back and neck injuries, Abrasions and burns, Amputations of arms or legs, Concussions, Heart attack or strokes on the job, Carpel Tunnel, Diseases caused by inhalation of chemicals or other toxins. Workers who are injured while they are intentionally trying to injure themselves or others, while they are intoxicated, or while travelling to and from work may not be eligible to receive Rhode Island workers' compensation benefits. If you have been denied Rhode Island workman's compensation for a workplace injury, talk to a Rhode Island workman's attorney. 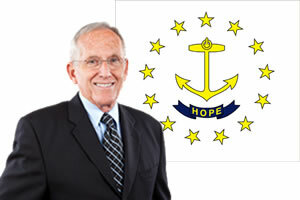 Workers' compensation in Rhode Island can include a variety of benefits such as: medical benefits, temporary total disability benefits (TTD), temporary partial disability benefits (TPD), permanent partial disability benefits (PPD), death benefits for surviving beneficiaries and vocational rehabilitation benefits. Medical treatment - Medical benefits are provided to Rhode Island employers who are injured on the job and can include paid medical care for all necessary and reasonable costs associated with the work injury. Medical care is provided at no cost to the employee (deductibles and co-payments should not be charged and are provided for as long as they are deemed medically necessary). Workers who have reached their maximum medical improvement level should consult with their employer to validate continuing medical treatment options. Unlike many other states, Rhode Island employees may choose their own doctors, but if they wish to switch doctors they need to talk to their employer. Temporary Total Disability Benefits (TTD) - Temporary total disability benefits (TTD) are provided to Rhode Island workers who are unable to temporarily return to any type of work due to their work injuries. TTD benefits begin on the fourth day of incapacitation and missed work. TTD benefits are paid at 75% of the Rhode Island worker's spendable earnings up to the state's allowable maximum amount. The worker may also be entitled to an additional $15 for each dependent, but the maximum amount of TTD benefits paid cannot exceed 80% of the injured worker's average weekly wage. TTD benefits may be paid until the worker reaches maximum medical improvement or until the worker is able to return to gainful employment. Temporary Partial Disability Benefits (TPD) - Temporary partial disability benefits (TPD) are paid to Rhode Island workers who are injured and can return to work but who are unable to make the same wages they could earn prior to their Rhode Island workplace injury. TPD benefits are paid at 75% of the difference between the worker's spendable wages prior to the workplace injury and after (up to the maximum amount allowed under the law). Permanent Partial Disability Benefits (PPD) - Permanent partial disability benefits (PPD) are paid to workers who are injured and have a permanent partial disability but are able to return to some type of employment despite their work injury. PPD benefits may be paid at 75% of the worker's spendable earnings. Permanent partial injuries may be considered scheduled or non-scheduled. Scheduled injuries are paid according to a schedule which is determined by the state. Non-scheduled injuries are paid up to the maximum of $908 which is the 110% of Rhode Island's average weekly wage and can be paid for a maximum of 312 weeks. Permanent Total Disability Benefits (PTD) - Permanent total disability benefits (PTD) are paid to workers who are injured and unable to return to any type of employment. PTD benefits are paid at 75% of the worker's average weekly wage, but they may earn an additional $15.00 per week per each dependent (not to exceed 80% of the worker's average weekly wage regardless of the number of dependents). Workers receiving PTD benefits may continue to receive them as long as they continue to remain totally disabled. Death Benefits - Death benefits are paid to the surviving beneficiaries of Rhode Island workers who died from their work injury. Death benefits may include compensation as a percentage of the deceased worker's wage. Death benefits also include burial expenses, up to the state's maximum allowable amount. Vocational Rehabilitation - Vocational rehabilitation services are provided to Rhode Island workers who are injured and unable to return to work. Vocational rehabilitation services vary by state but can include: job placement, job counseling, job medication and job reassessment.